There are no comments for Osprey Family Portrait No. 1. Click here to post the first comment. 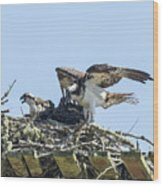 Osprey Family Portrait No. 1 One of three nests I was watching this year. This female had at least three offspring. The third is behind the two in front. 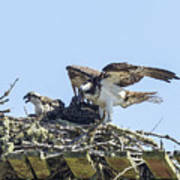 In a later photograph another head appears to the left, but I think it was the third young osprey making its way over. 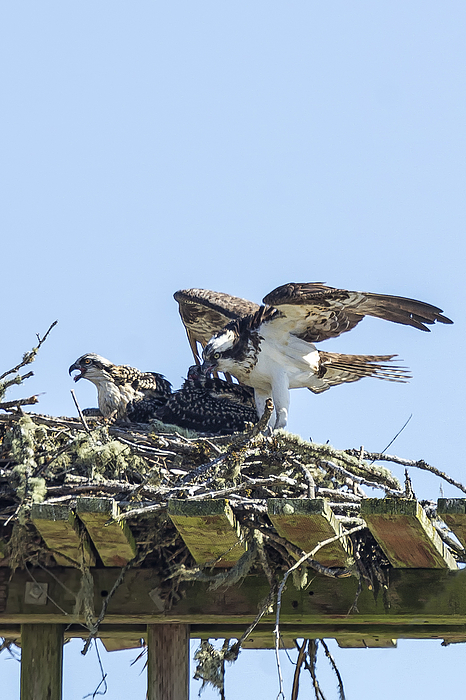 In the other nest, it appeared only one osprey was born. The nest was much higher up in a fir tree. 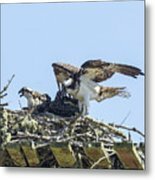 Once mature, Ospreys normally mate for life and generally live 7-10 years, although they can live as long as 20-25. Copyrighted - Belinda Greb * * * * * * * Nature, animals, beauty have been a source of nourishment throughout my life. Photography allows me to capture, interpret, and share that world of wonder I see about me, and sometimes use what I capture as an inspiration to create something new, by incorporating other exposures, textures or brushwork.